AUCHMORE is an 18th century courtyard situated on the south side of Loch Tay in Perthshire, less than a mile from the picturesque village of Killin. Visited by Queen Victoria in 1842, Auchmore enjoys a magical location offering the ideal balance between tranquil relaxation and easy access to a wide range of activities. Norma and Kenny Lang have two unique and beautifully maintained self-catering apartments at Auchmore. 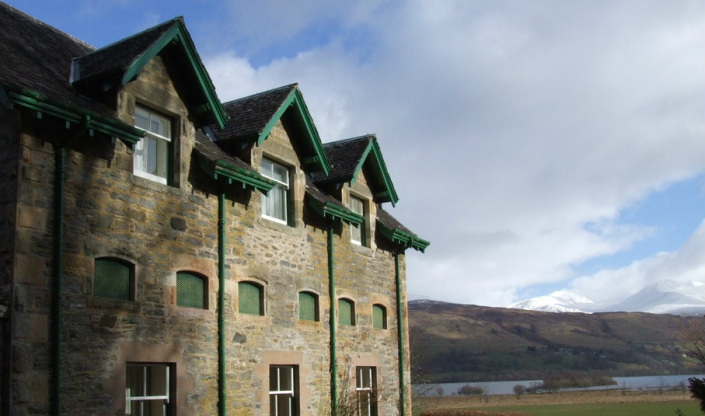 Each apartment benefits from panoramic views across Loch Tay to the spectacular Tarmachan and Ben Lawers Mountain Ranges. The apartments are located on the first floor of the courtyard conversion, extremely spacious and fully equipped for your self-catering holiday with free Wi-fi . Lawers sleeps 10/11 and Tarmachan sleeps 6. Situated within The Trossachs National Park yet only 90 minutes drive from Edinburgh or Glasgow, this stunning part of Perthshire is renowned for an extensive range of outdoor activities. Auchmore is also an ideal touring base to explore further afield. Browse our website to find out more about Auchmore self catering apartments and the surrounding area. For further information, call Norma on 01567 820646 or book a call back.